Well, POTUS and family are about to leave for Martha's Vineyard to relax for a week, then he comes back to DC for the Obama v Republicans fiscal stalemates of Autumn 2013. Oh joy, it's another round of Political Theater for the American people who deserve much better than these sorry jokers, many of whom probably cheated their way to office in the first place. Now you wouldn’t think so, would you? Of course, Neptune was yet to be discovered. 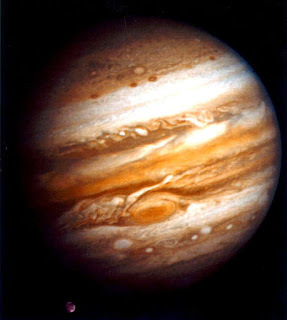 Outer planets are brought into our collective consciousness upon their discoveries when we are ready to ingest their concepts and manifestations for as with the Scriptures, we must be ready for light before it is given. Well, I won’t wax upon idealistic Neptune’s divine nature here, or its links to creative realms, for you may certainly Google your way easily into the Neptunian territories of American life if you so desire. Plus, Neptune's association with The Masses, The Media, and propaganda is well known. 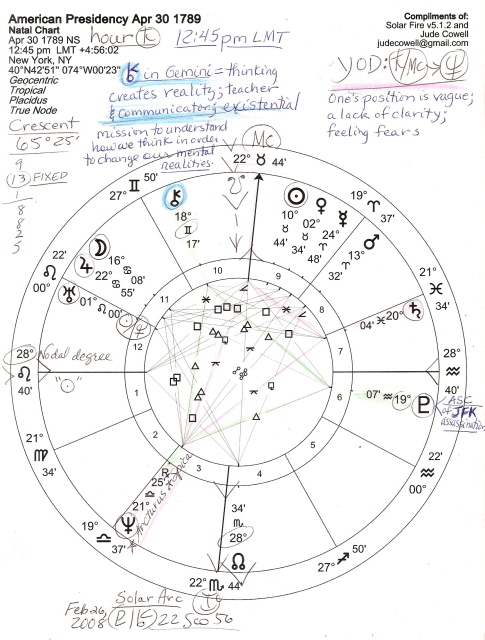 And you see that America’s natal Neptune of 1776 is conjunct this chart’s 2nd cusp of Values, Earning Ability, and the National Treasury. Americans do love to make money through creative pursuits including Neptunian film, theater, and music-–and spend money on entertainment, too. One of the more interesting features I found in studying this chart which stands for the US Presidency itself because it is the first Oath (even the time here is verified through historical record though technically there were other 'presidents' before George) is the placement of Chiron @18Gem17 in 10th house of Public Status in the world. As you know, the asteroid/planetoid/comet Chiron (the Wounded Healer) was discovered by astronomer Charles Kowal on Nov 1, 1977 @3Tau08 Rx; Chiron returns to Discovery degree in the years 2027-28–-it’s a three-fer due to retrogradation. So what’s the deal with a visible-to-the-world Chiron in 10th house? Using Barbara Hand Clow’s book on Chiron, we find that the crisis with a 10th house Chiron is over manifesting one’s true purpose on Earth. You are aware, of course, of the ongoing debate over America’s ‘Manifest Destiny’ which is her providential mission set in motion by her Founders and certain others, and which has reached the crisis stage in the New Millennium as our opinions on the ‘how and why’ are split in two. 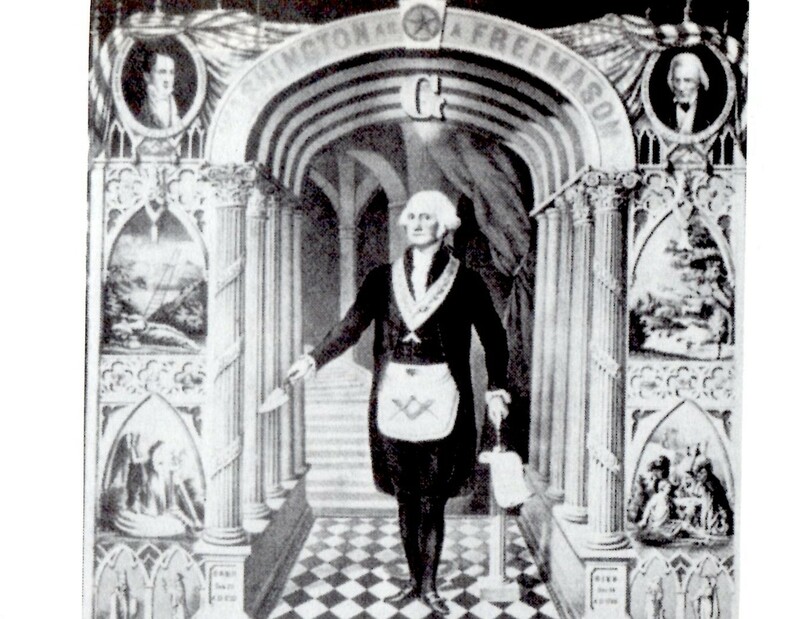 Because of George Washington’s well-documented membership in the Freemason brotherhood and perhaps in other secret societies as well, the Great Seal’s mysterious rider who magically showed up at Thomas Jefferson’s house with the Seal’s design, and a few other indications that our Founders were in on the ruse of masking (yet passing on) the mission, it may be assumed that a secret destiny is afoot even as I type, for Chiron in 10th house is very quixotic. And with 10th house’s association with authority (natural house of Capricorn, ruled by Saturn), a 10th house Chiron relates to a ‘mantle of power’ which looms large as a daunting undertaking for one man…a mere president. 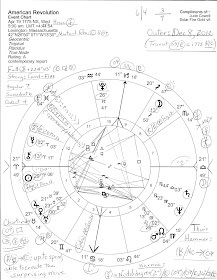 From studying Washington’s natal chart, I believe he was as unconsciously arrogant as the next president, yet it is said that he refused to be king and settled for the title of president with a built in time limit. Good idea–-use ‘em, then retire ‘em, is always the best course. Now with Gemini being the sign of communication, oration, writing, and the Eternal Youth archetype (America’s obsession with youth is quite tedious–Chiron is the “blindspot”), we know that mass consciousness is part of the presidential package–and Chiron in Gemini is highly attuned to it. The Geminian crisis here is to find new ways of integration and perception; the keyword is: awareness–-awareness that thinking creates reality. This Chiron is meant to learn how We-the-People think in order to change our mental realities, a concept that Science is just now catching up with. Moon is in Cancer, sign of Home and Domestic Scene. Most Americans seem to forget that there’s anywhere else in the world-–a love of home is typical, but we revel in things which are as American as apple pie. This brings in appetite and the nurturing qualities of Cancer along with comfort foods such as apple pie! 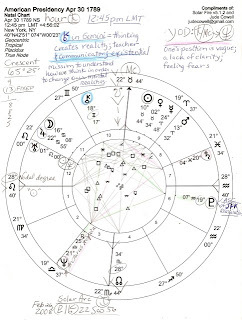 This Saturnian Hour, which was chosen for the American Presidency to be born, is perfect for exercising authority, management, and control; and with a Leo Ascendant, sign of the natural ruler–but also the sign of monarchy–the philosophical 9th house Sun in Taurus is the chart-ruler. Taurus relates to Freemasonry as the sign of the architect and builder. “I preserve,” says Taurus. It is my contention that as the “Father of Our Country,” this Piscean Saturn perfectly describes George Washington, the mystical Freemason and archetypal significator of the Presidency of the United Sates of America, a nation based on the Utopian ideal of Atlantis, charged with much revolutionary feeling, and manifesting in action toward her destiny...whatever it may ultimately turn out to be. Your thoughts on this horoscope and the history it represents are invited!